The olive tree is one of the most documented plants in history and has the distinction of being one of the longest surviving species in the plant kingdom. It is an evergreen, growing to about thirty feet, having a deeply grooved, gray trunk, small leathery leaves, clusters of small greenish white flowers, and a green fruit ripening to black. The trees still grow wild in the Mediterranean region, where they are also cultivated. They are extensively cultivated in similar climates in the Americas, in Iran, and beyond the Caucasus. Gathered throughout the year, the leaves from wild trees are believed to contain a higher concentration of active principles than from cultivated ones. It is thought that the olive tree was first cultivated in Crete about 3500 BCE. 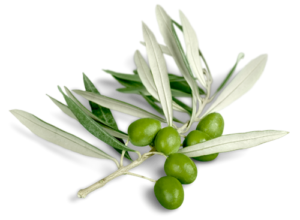 The olive has many symbolic associations, including its branches being linked with peace and its leaves worn as a victorious crown in ancient Olympic games. Since ancient times, the leaves have been used to clean wounds and the oil used in ritual anointings. Olive oil is nourishing and improves the balance of fats within the blood, lowering blood pressure and helping to improve the function of the circulatory system. Olives are mildly diuretic and may be used to treat such conditions as cystitis. The leaves are also used in some forms of diabetes as they possess some ability to lower blood sugar levels. The oil is traditionally taken by the teaspoonful with lemon juice to treat gallstones. It also has a general protective action on the digestive tract and is good for the skin. Externally, the oil is often used as a carrier oil for essential oils that require application to the skin for such conditions as burns, scalds, sores, and skin inflammations, including eczemous patches of dry skin. Used in treatment of bowel diseases, it is an excellent laxative for children, but dosage must be monitored carefully. The herb will also relieve the pain of intestinal colic, and has been recommended as a vermifuge but needs to be taken over a long period to be successful.